Move over Samsung Galaxy S4, there’s a new superphone in town! 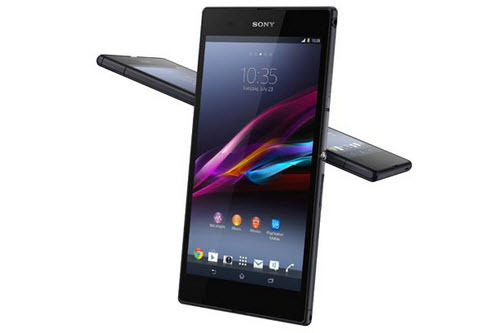 Sony’s just announced smartphone, the Xperia Z Ultra is big on both size and power. The Xperia Z Ultra will be the first phone sold globally that comes with the ultra powerful Qualcomm Snapdragon 800 chip. And it’s also big, like really big. Pushing tablet dimensions in fact. The Xperia Z Ultra is the first device by Sony that is ahead of the curve in terms of hardware, and will really appeal to spec junkies. Here’s what you need to know about the new behemoth from Sony! As mentioned above, the Sony Xperia Z Ultra will pack in a Snapdragon 800 SoC, with a quad core processor clocked at a blistering 2.2 GHz. If reference benchmarks are anything to go by, it leaves even the Exynos 5 Octa in the dust. The Xperia Z Ultra was leaked quite a few times earlier but was still a surprise launch. Speaking of which, the Xperia Z Ultra can hardly be called a phone, it’s absolutely huge. If you thought the Galaxy Note 2 was big, think again. It might be slightly ridiculous holding a device of this size to your ear, but it’s nevertheless being termed as a phone. All these impressive internals are built into a surprisingly slender frame that is only 6.5 mm thick! For reference, the iPhone 5 is 7.6 mm thick. However, it’s not light, tipping the scales at 212 gms. The best part is that it’s not a fragile device. The Xperia Ultra Z is both dust and water resistant upto a certain extent, and the screen is nigh scratchproof. In fact, Sony says that almost anything can be used as a stylus, including a regular pen or pencil. So, power, check; durability, check; good looks, check. The only thing that might hold the Sony Xperia Z Ultra back is the unruly size. In all other ways the Xperia Ultra Z looks like a mighty fine device, so it looks like Samsung and HTC have got a fight on their hands. It’s set to release sometime during Q3 2013 globally but no price had been mentioned yet. Sony has certainly got a head start over the Galaxy Note 3 and One Max, so game on Samsung and HTC. Do let us know your thoughts on this monster in the comments below! Rahul Gondane is a technophile and gamer, who has been obsessed with everything tech ever since he started dabbling in it in early 2000. He also enjoys reading books, listening to music and watching movies. Rahul is the Chief Operating Officer of Pyrite Technologies Pvt. Ltd.
What exactly is CyanogenMod? – Will this be the New Android Revolution? isnt this a convergence between tab and phone….this is a sort of device which kills tab and phone at once…..size in terms of calling function isnt a problem if u club it with other bluetooth devices which sony launched along side this….carrying though is….and talking about its dust and water resistance it is one notch higher than its smaller sibling sony xperia z, weight again isnt mch an issue if u compare with mega 6.3 which is all plastic and weighing 200 gms……lastly would it garner numbers for sony well i doubt because it would cost around 50-52k …. Of course, it’s a great device, some might like it and some might not.